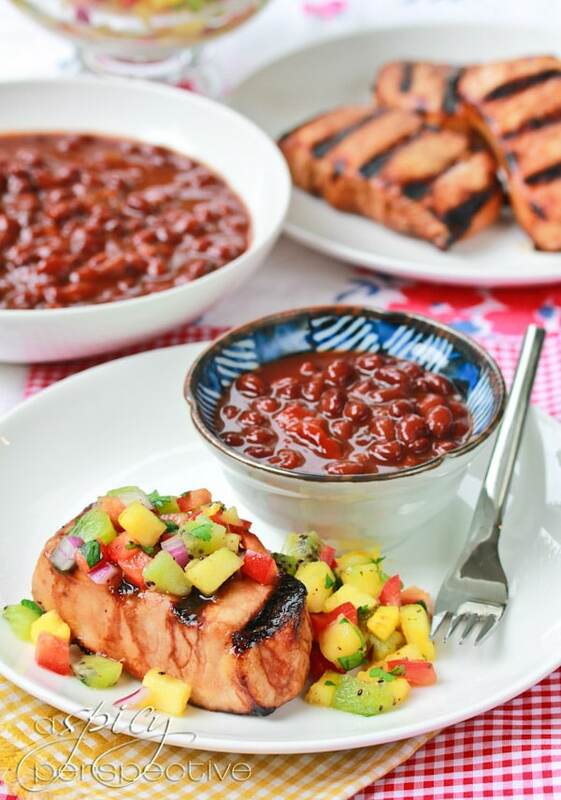 Grilled Pork Chops Recipe with Pineapple Salsa: What are you planning to grill up Memorial Day Weekend? 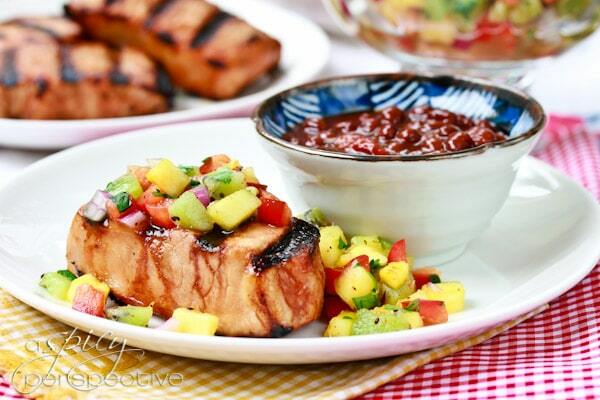 Try this deliciously easy Grilled Pork Chops Recipe with fresh Pineapple Salsa. We’ve got big plans Memorial Day Weekend involving friends, water sports and a LOT of food. Yet as much as I love to cook, I do not want to spend the entire weekend in the kitchen. That’s why it’s important to plan ahead, selecting a menu for the weekend that is easy to prepare, yet full of flavor. Bake ahead. Making cookies and treats to serve over several days allows for more fun time. Serve lots of fresh cut fruit. 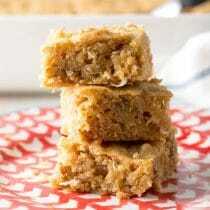 Easy, healthy, and a sure crowd-pleaser. Prepare double portions of dishes that make great leftovers. That way, tonight’s pasta salad can be served with sandwiches in a couple days. Make use of the grill. Grilling your meals, means quick smoky flavor and very little clean up. 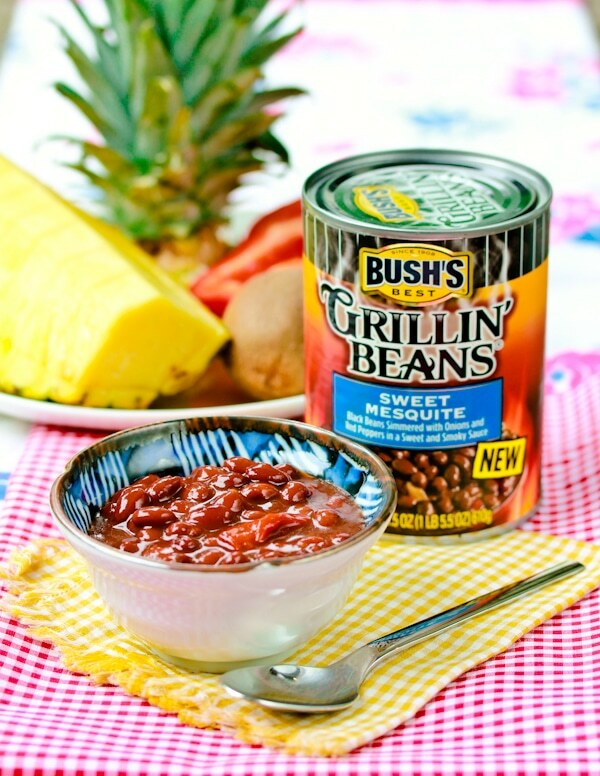 Serve favorite easy side dishes like Bush’s Grillin’ Beans. Doing these few things makes the weekend much more relaxing for me. And if mommy’s relaxed, everyone’s relaxed! This easy Grilled Pork Chops Recipe with Pineapple Salsa is a marvelous dish to serve Memorial Day weekend because it’s quick to make and loaded with flavor. The pork chops soak in a sweet, smoky and spicy marinade that offers a real kick. Then the fresh pineapple salsa with kiwi, red bell pepper and cilantro adds a cool and spicy element, and a pop of color. You can get kids to eat anything when you put a fresh fruit salsa over the top. Add Bush’s newest Grillin’ Beans flavor, Sweet Mesquite, to complement the smoky pork chops and you have a meal that makes everyone happy. Pour the soy sauce, liquid smoke, hot sauce and honey in a large zip bag. Shake to mix, then add the pork chops. Marinate for at least thirty minutes. For the pineapple salsa, mix all ingredients in a medium bowl and toss. Salt and pepper to taste. Refrigerate until ready to serve. Once the grill is hot, grill the pork chops for 3-4 minutes per side. You want the pork chops to be slightly pink or just barely cook through, but not dry. Cover the chops with foil and allow them to rest at least 5 minutes before serving. Serve warm with fresh salsa piled over the top. Disclosure: This post is sponsored by Bush’s Beans. All opinions are my own. These are awesome beans, folks! I made this for dinner Sunday night and LOVED it! So light and fresh. Perfect meal for a summer evening. Can’t wait to make a few more things I found on your website! Mmmm, these pork chops look scrumptious. I love the salsa you used to top the pork chops. Great way to make pork chops more seasonal, and bright! We just got a grill and I am so excited to try this! 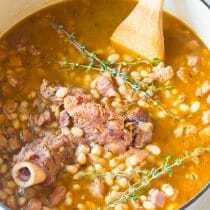 I’ve never had beans with chops, what a clever idea. 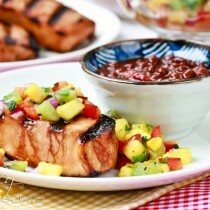 That nice porkchop with fruit salsa looks awesome.. delish delish!!! This looks so wonderful, Sommer. I love everything about the flavors and the ease of the new grilling beans. I want this right away. That salsa is calling my name! 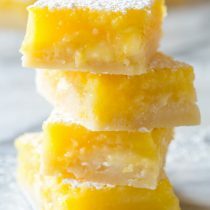 I have some fresh pineapple in the fridge – would love to try this over grilled fish. 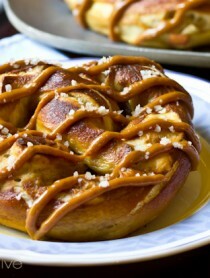 This looks delicious Sommer. I love everything about it. And you know what, I learned something new from you, I never scoop out my kiwis like that. We love them (and I just brought home big container from Costco yesterday) but I hate peeling them. I usually use a paring knife but it gets tedious. Going to try your way later :) Have a great day! 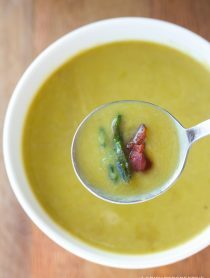 What a great summer/spring recipe! Your photos are so beautiful, bright and vibrant, too! Thanks for sharing, Sommer. One of my favorite things to eat with pork chops are pineapple – but this salsa sounds awesome. So excited for summer and grilling season. I love pork chops. We have a family marinade that I love to grill in the summer. I’m definitely going to have to make that fruit salsa! It’s gorgeous! This looks and sounds amazing! I think my husband will go ga-ga over these pork chops! Wow, this looks incredible! That salsa looks so refreshing, and the perfect complement for the pork chops. The boyfriend is going to love this! I am sure this will also be great for Thanksgiving…I love the festive presentation. It is never too early to start planning for the holidays, isn’t it? I am loving that salsa Sommer! This is such a great idea for a salsa, I’m sure it tastes amazing with those handsome pork chops! I adore pork chops, but I don’t think I’ve ever done them on the grill. How terrible is that? What a great recipe! I’m loving this salsa… First of all, kiwi? Really? That’s just the most fabulous idea… Never would have thought to include that, but it looks marvelous. 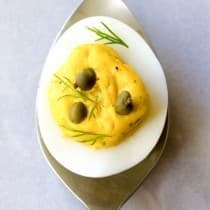 This sounds like a perfect summer dish! So beautiful! I’m a big fan of grilled meats with fruity salsa, so I can’t wait to try this. 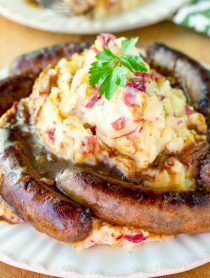 I’ll probably even pair it with the Bush’s Sweet Mesquite Grillin’ Beans too….looks like a great combo. This is such a colorful meal! That salsa totally steals the show! We eat a lot of pork chops in the summer — can’t wait to try this! I have been searching for a new (fun) pork chop recipe. Love this salsa! 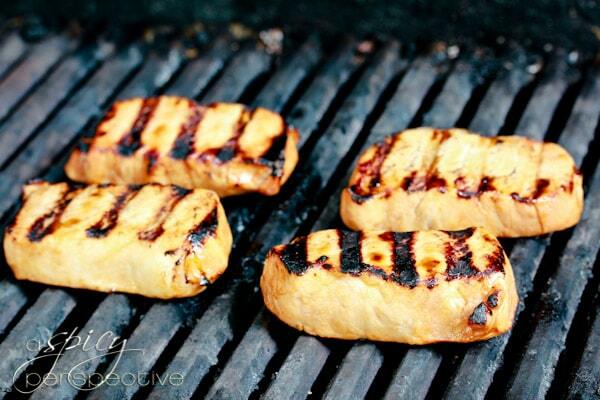 Pork is one of our favorites and grilling it is perfect this time of year. 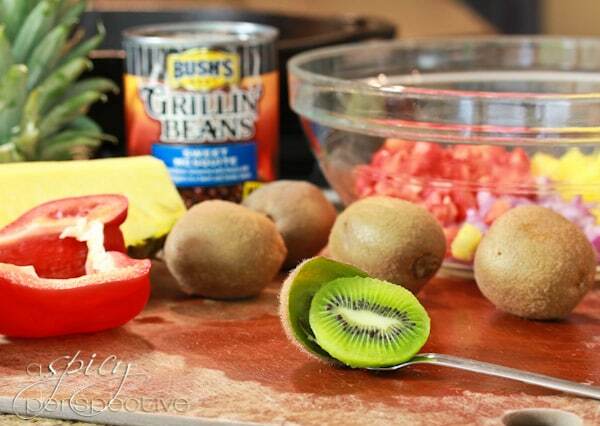 I love your pineapple kiwi salsa as well…all of it looks gorgeous together! If only I had this for lunch today! Gorgeous! Not much I don’t love about this! Wait…is it really almost Memorial Day?? I love how colorful this pork chop recipe is! Looks delicious, Sommer! I love your tips about preparing food ahead of time, and lots of fresh fruit. We live near the beach, and my girls love nothing better than COLD, fresh fruit when we’re there all day. Mmm!! Heavens to BETSY this just did me IN.